G. W. Clarke, surveyor of customs at the port of Kansas City, issued his monthly statement yesterday showing a gain of 58.5 per cent in the receipts of his office in customs duties over the month of January, 1909. In January of last year the receipts amounted to $48,541.39, while for the month just past they amounted to $77,367.12, a difference of $28,825.73. Every month this office has shown a gain over the like month of the year before. "We received our first shipment of coffee from Mexico today," said Mr. Clarke. "The shipment reached nearly 50,000 pounds. It was unusual, as heretofore most of our coffee has been imported from Brazil. Americans have bought vast tracts in Mexico, however, and have begun raising coffee there." There are no import duties on coffee and tea, but they have to pass through the custom house just the same. A separate report is kept of the free and dutiable imports. Coffee and tea is examined by experts to see that it is good. All tea shipped here is opened and samples sent to Chicago to be tested. Not long ago an entire wagon load was ordered dumped into the river as unfit for use. There is no such chance to cheat in shipments of coffee as there is in tea, but the government tries to protect the consumer by ordering both examined by men who know the goods. LIBERTY, MO., Jan. 18. -- This express office here received last night the old cap started from Fort Worth, Tex., several months ago. It originally had but one tag on it which reads, "I wish to see the world." The tag was dated and asked that it be returned July 4, 1910. It had thirty tags on it representing different stopping places. It had been to Portland, Ore., New York, and many other large cities. At Liberty it had its first Adams Express is placed on it. After it has run on company's lines for a while it is changed to another. From Liberty it was sent to Cameron Junction. Although the weather was much warmer in Kansas City yesterday, winter conditions elsewhere continued to derange the train schedules of the railroads running into Kansas City. Few trains are operated on time. The delays are general in all directions. "For some reason, prosperity I guess, travel is unusually heavy just now," said a Union depot official yesterday. "Many people get laid out here because of late trains." So that he, at least, might escape the tong war in San Francisco in which an uncle has met death and in which his relatives are all involved, Jeu Bing, a Chinese boy, was spirited from the California city at night and with $500 in gold in his pocket was placed aboard a train for Chicago. His ticket called for a change of trains at Kansas City, and he spent a couple of hours yesterday morning in the Union depot. The boy has letters to several Chinese merchants of Chicago and it will rest with them as to whether he continues East or remains there. A price, it is said, has been placed on Jeu's head by the tong faction said to be responsible for the death of his uncle. Jeu is 16 years old. He was born in San Francisco's Chiatown and was left motherless when a little child. The boy attended the Presbyterian Sunday school there and acquired the English language rapidly. With his knowledge of the Chinese tongue and his familiarity with the denizens of his section of the city he was frequently called on by the authorities as an interpreter. It was while engaged in some of these cases that he gained the enmity of influential Chinamen who were his father's rivals in business. After the earthquake, Jeu was constantly in demand. The authorities wanted information on the mysteries of the Chinese section. They thought that they could get it from Jeu. If they did, it is a secret, for Jeu declares that he knew nothing of the underground passages and the hovels and haunts of the criminal Chinese. After the restoration of Chinatown much of the blame for the activity of the authorities was laid to the Bing family. Then came the tong wars. How his family were interested in these, Jeu could or would not say. It was sufficient that there was bad feeling, he said, and to make matters worse his uncle was one of those who was stabbed in the back one night. His body was found the next day. There was much excitement in the Chinese quarter. There were other assaults and the other members of the Bing family remained indoors. Two weeks ago a friend notified them that Jeu was one of the Chinamen on whose head a price had been put by one of the tongs. Friendly Chinamen were called in consultation. The authorities, who were told of the threat, suggested that Jeu secure the names of some of the Chinamen suspected and they would be arrested. He was unable to do this, and at a friendly council it was decided to send Jeu away from the city. This was the hardest part of the programme. It was known that the house was under surveillance, and it was with difficulty that Jeu was spirited out. He was dressed in a woman's walking suit with a heavy veil, and in this costume made his way to the railroad depot, where a detective purchased his ticket. He had a purse containing $500 in gold, the most of which he brought to Kansas City with him. Arriving here early yesterday morning, Jeu presented a note to Station master Bell. The latter escorted him to Matron Everingham, who made the boy comfortable and kept him out of sight until the time for departure of his train to Chicago. The boy feared that if his presence in the depot became known some Chinamen, enemies of his family, might telegraph to San Francisco and that members of the tong who were sworn to kill him would follow. Jeu was an entertaining conversationalist and also a good quizzer. He asked hundreds of questions of the "red caps" as to the size of the city, the number of Chinese in the town and also expressed wonder that there was no Chinese quarter and no Chinese servants. He took the names of several who had been kind to him and said that he would send them a little token of his regard when he returned to San Francisco, which he hoped would be soon. Jeu said that he was a nephew of Lee Bing, the deceased Chinese philanthropist of St. Louis. Over a score of members of the Bing family, he said, came to America about a quarter of a century ago. Many of them are dead, while some live in El Paso, Chicago and New York. The rest all live in San Francisco. Enchanting is the romance of the Golden West, the story of mountain and plain. Forming the most striking drama in American history, the record, alas, is but fragmentary -- the half has not been told. For, imperfectly have the annals been kept of the vast domain west of the Mississippi river from the time of early settlement to the present. Evidences of marvelous transformation are at hand, fruits of pioneer privations are enjoyed, but the annal of achievement in details has been neglected by historians. Reminiscences of early settlers can now alone supply the deficiency. To a great extent has the history of Independence, Mo., to do with that of the West. This city was the scene of the initial step in the march of progress. Preparatory to crossing the desert, westward bound caravans procured supplies there. Frontiersmen, explorers and prospectors, returning home, brought to Independence the first news of discovery, for this city was then the greatest trading post in the West. Prominent among the pioneers was Henry A. Schnepp, who is now a resident of Galesburg, Ill., but is now visiting his brother, David Schnepp, at the latter's home, 413 Whittier place. Mr. Schnepp was conspicuously identified with the early growth of Independence and lived there for fifteen years, leaving during the year 1890. "In the early fifties Independence was the outfitting point for all the country west of the Missouri river and was the headquarters for frontiersmen," said Mr. Schnepp yesterday afternoon. "The paramount issue was to retain this lucrative trade and active measures were adopted with that end in view. This gave impetus to the construction of the first railroad in the West, which ran from the river to this city. A depot was built at Wayne City and a terminal established at the postoffice. The cars, which ran over wooden rails, were drawn by horses. "Before the construction of the Hannibal & St. Joe Railway in1856 all transportation was by river. Apropos the recent agitating with regard to navigating the Missouri, it seems to me that as the river was navigable then, it should be now." Mr. Schnepp staged through Iowa when that state was but sparsely settled. When he traveled along the Hawkeye frontier in 1854 the capital of that state was located at Iowa City and the territory west of Des Moines, the present capital, was inhabited almost exclusively by Indians. "I could never forget the first overland mail route to Salt Lake City. The mail was carried by stage coach and the trip required many days under favorable weather conditions. The route extended from Independence to Westport, thence to Fort Riley, in Kansas; Fort Bridges, in Wyoming, and on to Salt Lake. The charge for carrying each letter was 25 cents, collectable on delivery. Prior to the establishment of the pony express in 1853-4, mail from the West was carried by a boat around Cape Horn." Mr. Schnepp says that the gold fields of California were discovered by Joseph D. Childs, an uncle of C. C. Childs, an Independence banker. A contractor by profession, Joseph Childs was erecting a mill near Sacramento when workmen excavating a race found gold. This discovery started the rush to California, and Mr. Schnepp was one of the first to go for a fortune. He did not acquire fabulous wealth, but returned home with enough gold that he has not since been called a poor man. At 12 o'clock, noon, tomorrow, Argentine, the Silver City, of which great things were expected in the early '80s, will merge its identity into that of Kansas City, Kas. This additional territory will be known as the Seventh ward and will be represented in the Kansas City, Kas., council by two councilmen to be appointed by Mayor U. S. Guyer. By the annexation of Argentine and the extension of its city limits Kansas City, Kas., will have graduated into the class of metropolitan cities. It is estimated that the additional territory will increase the total population of Kansas City, Kas., to something in excess of 135,000. Steps have already been taken by the city authorities to assume active charge of the former city's affairs. Two police sergeants and eight patrolmen will afford police protection for the new ward. Argentine was organized as a city of the third class in 1881. The city covers an area of six square miles and has a population of 7,000. It is on the south of the Kaw river and just south and west of the Sixth ward of Kansas City, Kas. The majority of Argentine's residents are hard working, industrious home owners. The city has a bonded debt of about $126,000, in addition to special improvement bonds to the amount of $70,000 and school bonds for a like amount. There is also $60,000 in outstanding warrants. The consolidated city assumes all these debts. While the new territory is in debt to no inconsiderable amount, there are many advantages to be gained by its annexation. Argentine has two miles of bitulithic pavements and also two miles of macadam paving. In addition to this there are about fifteen miles of paved sidewalks. A fire wagon and a team of good horses, also 3,000 feet of new hose, are among the assets. Many commendable things can be said concerning the system of schools in the new ward. There is a high school recently completed and five ward schools averaging eight rooms each. The teachers in these schools will be continued in their respective positions by the Kansas City, Kas., board of education. Among the industries in the newly acquired territory are the Atchison, Topeka & Santa Fe railroad shops, the Kansas City Structural Steel Works, the Santa Fe Car Iceing Company and the United Zinc and Chemical Company. Of these the Santa Fe employs the larger per cent of the people of the city. Two of the largest grain elevators in the state are located at the Argentine terminals of the Santa Fe, one with a capacity of 1,000,000 bushels and the other, one-half that size. One of the urgent reasons for annexation from the Argentine standpoint was the inability of the people of that city to obtain natural gas. This condition of affairs will be remedied by the merger. The Wyandotte Gas Company will extend its mains to the new ward. C. W. Green, the last mayor of Argentine, during his four terms in office had much to do with the progressing of public improvements. As to just what the effect of the Annexation will be on the complexion of politics is problematical. Persons in a position to know declare that the Democrats and Republicans are about evenly divided. At a special meeting last night of the Kansas City, Kas., council the Democratic members refused to confirm the appointment of C. W. Green and J. W. Leidburg as councilmen for the new ward. Mr. Green is at the present time mayor of Argentine and Mr. Leidburg is a councilman in that city. MAP SHOWING ORIENT LINE TO DEL RIO, WHICH WILL CONNECT WITH THE I. R. OF M. FOR CITY OF MEXICO. WICHITA, KAS., Dec. 25. -- Announcement was made here today that contracts for the right of way from San Angelo, Tex., to Del Rio, Tex., have been signed by the Orient railroad and the local municipalities and actual work on the construction of a branch to connect with the International Railroad of Mexico will be commenced February 1. This will give Wichita, Kansas City and intermediate shipping points a direct line to the City of Mexico. The contract provides that the road is to be completed June 1st, 1911. Simultaneously the information was given out here today that the Mexican government has agreed to spend $6,000,000 and a Mexican capitalist $4,000,000 on irrigation projects in Northern Mexico along the line of the International road. Millions of acres there will be transformed into veritable truck beds. Lee's Summit, twenty-five miles southeast of Kansas City, unable to cope with a fire which threatened the business section last night, appealed to Kansas City for aid and a special train, carrying a fire engine and hose reel, went out over the Missouri Pacific at 11:45 o'clock, nearly two hours later. The fire started from a stove, which was located over the M. A. Kinney grocery store. In a few minutes the entire business section of the town seemed doomed. By midnight three business buildings were badly burned and two others were damaged. T. M. George, a real estate dealer, was overcome by the heat, but was rescued and revived. No other injuries were reported. The Lee's Summit fire department was badly handicapped. The company had only a gasoline pump with which to work. Water was pumped from a public well. Two streams of water were being directed on the fire when the pump broke and the volunteers were rendered helpless. The Kansas City's aid was sought. A special train was made up of two flat cars and one caboose. The fire engine and reel was from No. 1 station. Nine men were taken along from Company 16 with Assistant Chief Alex Henderson in charge. The special train reached Lee's Summit at 1 o'clock this morning. when the Kansas Cityans arrived the entire population of Lee's Summit, numbering 2,000, out fighting the fire in their helpless way, cheered wildly. The engine and reel were unloaded at once on skids and in fifteen minutes a big stream was being played on the fire. the water from the old mill pond was used. The flames were checked rapidly by the Kansas City firemen, and the impending complete destruction of the business district was prevented. The entire stock and goods of the M. A. Kinney company, in whose building the fire started, were completely destroyed. The flames spread to the building belonging to J. D. Ocker, which was occupied by his stock of furniture and hardware. The entire building was destroyed, including Mr. Ocker's complete stock of goods, and also the offices and fixtures of Dr. J. C. Hall, who occupied the floor above. The fire next caught at the Citizens' National bank and the building and all the fixtures and property were consumed except the fire-proof vaults. The J. P. McKisson building located east of the burned block was saved by the valiant work of the volunteer fire department, under the command of H. Lewis. The volunteers had played their streams on this building until the breaking of the apparatus. One business block was practically saved. In this was the W. B. Howard Clothing store occupying the ground floor and the Bell telephone company on the floor above. The loss of the Bell telephone company exceeds $3,000 although the local office was but slightly damaged. Only a week ago the company had rewired the town. All connections and cables were burned and the service completely destroyed. W. B. Howard, cashier of the Citizens State bank declared that his business was the only one affected entirely covered by insurance. In the Citizen's Bank building, where the Kansas City firemen finally checked the fire, were located the offices of Keupp & Kimball, a real estate firm, and also the rooms of the city council. All the records and papers of the city were stored in the city rooms, and were a complete loss. The Kansas City firemen directed two streams of hose on this building and within twenty minutes had the fire put out. There was plenty of pressure and 1,200 feet of hose were used. The loss will aggregate $65,000. The damage to the buildings was estimated at $15,000, while conservative estimates place the damage to the goods at $50,000. M. A. Kinney carried $1,000 insurance on both his stock and his building. J. R. Leinweber, president of the bank at Lee's Summit, announced immediately after the fire that plans would be taken for an early re-building of the bank building. The bank is capitalized at $26,000 and has a surplus of $15,000. Its deposits at the last quarterly statement were $108,00. All the valuable papers and bonds held by the bank were deposited in the fire-proof safety vaults, which were uninjured by the fire. Cornelius Vanderbilt, whose friendship for George J. Gould, together with the latter's need for additional capital in the Missouri Pacific secured for him a place in the directorate of that road, was in Kansas City again for a few minutes yesterday morning, stopping for an inspection of the new Missouri Pacific freight house at Union avenue and Liberty street, while engines were being changed on the special train. The new Missouri Pacific director, while not at all a talkative man, expressed disappointment at not being able to take a trip over the city and view the growth of it since his last visit here, about eight years ago. "I am coming back to see your city in the spring," said Mr. Vanderbilt, "and I may invest in your new terminal bonds." So that J. Bottomly, 90 years old, and his wife, 85 years old, would not have to wait about the Union depot, a sleeping car on which they had berths to California, over the Santa Fe railroad, was backed into the train shed and they were assisted to it an hour before the usual time last evening. The couple are to spend their last days in Southern California. They have lived in Minneapolis, but recently doctors told their relatives that if the old folks desired to prolong their lives they would have to remove to a balmier climate. They arrived from Minneapolis via the Burlington road about 5 p. m. They were assisted into the depot, but the noise and drafts annoyed them. Their train was not due to depart until 9:25 p. m., but attaches of the Santa Fe railroad thought of the special sleeper which is attached to the train here and had it backed into the train shed around 8 o'clock. The old couple were transferred to it. The sum of $939,000 in subscriptions for the promotion of the work on the Kansas City, Mexico & Orient Railway is the result of the recent trip conducted by President A. E. Stilwell and Edward C. Dickinson, vice president of the railroad company. The trip was taken the first of this month, lasted fifteen days, ending the first of this week. Mr. Dickinson was accompanied by a party of Eastern business men and capitalists. He pronounces the trip a success from a business standpoint as well as in every other way. Before the trip was completed $789,000 had been subscribed by the men of the party and since then the other $150,000 has been sent in. The trip started at Chicago, the party being taken in a special train. Th intention was to go straight to El Paso and down to the City of Mexico directly from there. However, storms, washouts and swollen streams made that particular rout out of the question. So the party had to give up the idea of going over that section of the company's tracks. 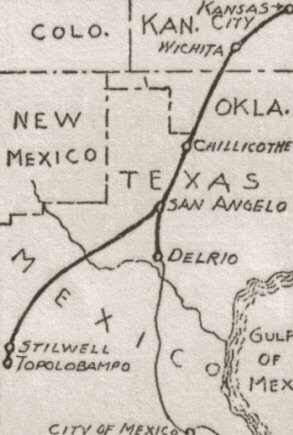 The trip South was therefore by way of Chillicothe, Fort Worth, San Antonio and Laredo to Mexico City. The latter part of the trip was made over the Orient lines. The return trip took the party over the Mexican Central to El Paso, over the Texas Pacific to Sweet Water and on into San Angelo. The Kansas City, Mexico & Orient line was then followed as far as Altus where the Frisco was traveled to St. Louis. At the last mention place the party disbanded. Mr. Dickinson returned directly to Kansas City, disappointed in only one thing -- the party had not been able to travel over as much of the company's tracks as had been desired. The work on the road is to be pushed as fast as possible and all of the improvements contemplated will be made in both roadbed and rolling stock. When asked in regard to the personnel of the party Mr. Dickinson said he preferred not to give out the names yet because of reasons which also he didn't care to make public. However, he said that John F. Wallace, former chief engineer of the Illinois Central railroad and chief engineer of the Panama canal, who is also a vice president of the Kansas City, Mexico & Orient railway, was one of the party. Mr. Wallace, said Mr. Dickinson, has only recently been made vice president of the road to fill the place of George Crocker, recently deceased. Further that the above Mr. Dickinson said he could say nothing for publication. When the main line of the Kansas City, Mexico and Orient railroad is completed into Kansas City, it is likely that the Orient trains will enter the new Union passenger station. At least efforts to this end will be made this morning. A. E. Stilwell, president of the road, and E. Dickinson, vice president and general manager, will arrive in Kansas City this morning with a party of Eastern capitalists and stockholders. The party will arrive in a special train of seven sleepers over the Rock Island, at 8 o'clock. While here there will be a meeting with President H. L. Harmon and other officials of the Kansas City Terminal Railway Company, and admittance to the organization will be sought. The Orient officials have but little doubt that satisfactory arrangements can be made as there is no real opposition to the plan. It is not known as yet just how the Orient will enter the city, whether on their own tracks or those of one of the other roads, or the exact location of on their own tracks. The right of way from Wichita to Kansas City has not been secured. The company, however, expects to be operating trains from Kansas City within the next four years, probably by the time the Union depot is completed. Mr. Stilwell and his party will remain in Kansas City until noon, leaving for Wichita over the Rock Island. From Wichita and inspection of the system will be made, as far as the present tracks are built. The greater part of the Orient system is already in operation. From Wichita, Kas., to San Angelo, Tex., is a stretch of track 510 miles in length over which three through trains each way are to be operated daily. From Marquez, Chihuahua, 300 miles southwest of San Angelo, there is another completed stretch of track 287 miles in length extending to Sanchez, Chihuahua. A train each way is operated daily over this portion of the system. After another uncompleted stretch of 200 miles the Orient is complete from Fuerte, Sinaloa, to Topolobampo, the terminus of the system on the Gulf of California, over which daily train service is provided. The only other uncompleted portion of the system is from Kansas City to Wichita, 208 miles, making in all about 500 miles of the system and 1,659 miles yet to be completed. The Orient party headed by Messrs. Stilwell and Dickinson will spend a month in the United States and Mexico inspecting the system and making whatever arrangements are necessary to hasten its completion. SOUTH ELEVATION OF NEW UNION PASSENGER STATION. Five million, seven hundred and fifty thousand dollars will be the cost of Kansas City's new Union passenger station. The plans prepared by Jarvis Hunt, a Chicago architect, were accepted yesterday by the board of directors of the Kansas City Terminal Railway Company. As soon as the stockholders of the several railroads that are to use the depot ratify the action of their representatives, work will begin on the structure. This consent is expected to be immediate. In a few months dirt will be flying and construction under way. The main entrance to the station will face south. It's exact location will be twenty-five feet south of Twenty-third street, and 100 feet west of Main. The frontage of the main building is to be 512 feet. The train sheds are to be 1,400 feet long, and are to be constructed so that trains east and west can run through. The exterior will be of stone, concrete and steel. The roof will be rounding or barrel shape. The general lobby is to be 350 feet long and 160 feet wide, and the decorations and accommodations will be rich and elaborate. Especial care has been taken in lighting and ventilation; the ceiling will be arched, and will be 115 feet high. The interior walls will be of marble, and massive columns will grace each side of the passageway into other parts of the building. The center of the lobby will be the ticket office. Adjacent will be the baggage room, where passengers can check their baggage and not be annoyed with it again until they reach their destination. In a space of 75x300 feet off the lobby will be the restaurants, lunch rooms, waiting rooms, men's smoking rooms, and other utilities. Telegraph and telephone stations, a subpostal station and other accessories will also find places within this space. On the upper floors will be located the offices of several railroads using the depot together with rooms for railway employes. Space has been set apart for dining and lounging, reading, and billiard rooms. From the center of the lobby and above the track will extend the main waiting room, on either side of which there will be midways or passages leading to the elevators to carry passengers to the trains. Smoke and gases from the locomotives will be s hut out from the station by a steel and glass umbrella shed. There will be three levels to the depot. These are to be known as the passenger level, the station proper; the train service level, from where passengers take the trains, and which is connected with the midways by eight big elevators on either side, and also, stairways; and the level on which are the baggage rooms, express and postal service. Charles J. Smith, formerly of Kansas City, built the Alaska-Yukon-Pacific exposition. The fair closed several weeks ago. The builder got little credit. It was his own fault. He stopped the publicity department of the fair from using his name in connection with the work. It was many years ago that "Charlie" Smith ran about the hillsides of Kansas City, up and down the ravine that was converted into Delaware street, and raced his brothers to their home on what is now Wyandotte street. The family came from Kentucky to Kansas City just before the close of the Civil war. Being strangers and moreover Smiths -- both not uncommon in the growing town -- they passed unnoticed. "Charley" Smith went to the schools of Kansas City. After he got older and became ambitious, a friend got him a place in the offices of the Kansas City, Fort Scott & Gulf railroad, now a part of the Frisco system. Smith became a civil engineer. When the Kansas Pacific railroad was being built, the road needed Smith. Smith needed the job and took it. He remained several years. Then he was placed in charge of a large and difficult but of engineering on the Oregon Short Line. The Smiths left Kansas City. Smith's father also entered the employ of the Oregon Short Line and removed nearer the work. Smith gathered fame as an engineer by doing many difficult jobs. He also became wealthy. When Seattle needed an engineer with big ideas and experience, it asked Smith to undertake the work. But he got little personal advertising out of it. He chose the plans, erected the buildings, beautified the grounds and had the work done on schedule time, the first time a big exposition was ever completed by its opening day. "I am Charles J. Smith. I have been put in charge of building the fair. You can write about it and puff it any way you see fit, but if any of you connect me with the work by using my name, you will be fired in a way that you won't forget." That's why it was necessary now to give out, at this distance from Seattle, that Charles J. Smith built the fair. All Seattle and the Northwest, or course, could not help but know who built the fair. Young Smith attended the Humbolt school when the institution was on Eighth and May streets. "He is the son of a man the old-timers will remember as "Deacon Smith," a pillar of the Second Presbyterian church in the early days," said Colonel E. S. Jewett yesterday afternoon. "He came here when he was about 5 years of age, and went to school with my sons and Jim McGowan and that crowd. The old Humboldt school boys will recollect little Charlie Smith well. When he got out of school, young Smith started railroading. The Memphis ran all the way to Paola in those days, and Smith got a job in the general offices. T. F. Oakes and C. H. Prescott, both with the Fort Scott road, left it to go to Portland, and they induced Smith to go with them. They also took the roadmaster and one or two others. I had lost sight and memory of the boy till now. I see he has a page in the Evening Post. As he has made his million, built the Alaska-Yukon fair and established a national reputation we might as well recollect him. Kansas City will be the host today to the Honorary Commissioners of Japan, consisting of forty-three of the leading business men and educators of the Oriental empire, who, together with five Japanese women, are touring the United States. No efforts will be spared to entertain the foreign guests during their stay here, which will be from 9 o'clock in the morning until 11 o'clock at night. Following the arrival here the party will breakfast in their special train. At 9:30 the men of the party will be met in automobiles by the members of the Commercial Club and the next hour and a half will be spent in a reception in the club rooms. The club rooms have been decorated with palms and ferns, the stars and stripes, the Japanese national flag, the mikado's coat of arms, and the Japanese man-of-war emblem. Judge W. T. Bland, president of the club, will head the receiving line, and in it will be the forty-three Japanese commissioners, the officers off the Commercial Club and all former presidents of the club. At 11 o'clock the party will be taken to the Westport high school, where Baron Kanda, head of the school of the nobility in Tokio, will make a short speech. Baron Kanda speaks English fluently and is a graduate of Amherst college. The address will be followed by a drive through Swope park and a stop at the Evanston Golf Club for a buffet luncheon. After the luncheon the party will be driven through the city, up and down the principal streets, over the boulevards and through the leading parks. The first place of interest to be visited will be the Bank of Commerce. This will be followed by an inspection of the Burnham-Munger overall factory. A drive to Kansas City, Kas., is next in order, where the party will be shown through the plant of the Kingman-Moore Implement Company. These will be the only places visited during the day. While the men are being entertained by the members of the Commercial Club the five women in the party, Baroness Shibusawa, Baroness Kanda, Madame Midzuno, Madame Horikoshi and Madame Toki will not be forgotten. A committee composed of the wives of the Commercial Club directors and Mr. and Mrs. E. M. Clendening will entertain them. A visit to the Westport high school, a noon lunch at the Country Club and a tea at the home of Mrs. W. R. Nelson will be the events of the day which have been mapped out for the women. At 6:30 o'clock in the evening a dinner will be served to the men in the banquet room at the Baltimore hotel. At the same time a dinner will be given for the women in the Japanese room of the hotel. At the conclusion of their dinner the women will repair to the banquet room, where the entire party will listen to the addresses by David R. Frances, Senator William Warner, Baron Shibusawa and Baron Kanda. Judge Bland will act as toastmaster. This will conclude the events of the day. The visitors will be taken back to their train, and will leave for Omaha, from where they will work west to San Francisco, from which port they will sail for Japan, November 30. The Japanese arrived in Seattle from Japan September 1, and when they leave will have spent eighty-eight days in America, visited fifty-two cities, and traveled more than 11,000 miles. During this time they have visited plants and institutions representing nearly every American industry. Many of Kansas City's leading industries will not be visited, as the party has been to similar ones in other cities. Baron Elighi Shibusawa, who is the head of the commission, is one of the leading men of Japan, being both a statesman and a financier. His individual efforts have raised the status of business men in this country. In 1873, Baron Shibusawa organized the first national bank in Japan under the capital stock system, and has been connected since with all leading banking institutions in Japan. One Pullman dynamo car, a baggage car, a Pullman dining car, four ten-compartment sleepers, one twelve-section drawing room car and a six-compartment observation car comprise the equipment of the special train that will bring the Japanese to Kansas City over the Burlington railroad. The train will be in charge of W. A. Lalor, assistant general passenger agent for the Burlington at St. Louis. Down at the Union depot last night a dog, half Scotch collie and half, well, the other half is just dog, perhaps, crouched at the feet of a man, a typical cattleman of the plains, who wore clumsy boots, trousers that were turned up half the length of the boots and a crumpled white hat. That there was a story of intense devotion on the part of a dog to his master and of a master to his dog in the picture presented in the waiting room not one who saw them doubted. The fidelity of the dog attracted every man and woman who observed it. John H. Pridemore was the man and he raises cattle on a range near the Kansas and Colorado line. His home is thirty-five miles from Fowler, Kas., the nearest railroad point, and the dog with him last night is his only companion in a country where his nearest neighbor is miles away. "That dog is the nearest thing to a human being I have out in my country," said Pridemore, "and I'd be mightily lonely without him. I raised his mother, and she was my companion before the pup was born. He's one of the most intelligent and sympathetic dogs you ever saw. The only name I ever gave him is 'My Boy.' I don't know why I called him that unless it was that he is the only companion I have and the only responsibility, too. He's a true friend and he's smart. There can't a thing go wrong on my place that his ears don't hear it or his eyes see it. And when he finds that something has gone wrong he romps to the house and tells me about it. "Often I sing the old songs and he's gotten so that he sings with me. When I sing loud he barks as noisily as he can; when I sing low he follows suit. You know, that dog seems to understand everything I say. Often at night he puts his paws on my knees and lays his head in my lap and I tell him stories, just like you'd tell stories to a child, and he's all attention. "This is the first time I ever brought him to Kansas City and I'll tell you how it happened. Heretofore I've left him with some of the boys, but when I started to Fowler with a bunch of cattle a week ago I took him with me to help me load, intending to leave him at a hotel there. Well, when we got the cattle on the cars and I was ready to jump into the caboose the 'boy' followed me to the platform. There were big tears in his eyes and he began to moan. This was too much for the conductor and he said to bring him along. 'He may get lost up there in Kansas City,' I said. The conductor assured me that he wouldn't so the dog was lifted into the caboose and started on his first long journey from home. I've had this rope around him ever since we've been here and now we're headed back to the ranch." "Would you sell him?" asked a man, who had been listening to Pridemore's story. "Not for a million dollars," said the cattleman, decisively. Pridemore and his dog started for the Rock Island train. "My boy" had to ride in the baggage car and when he say that he was to be separated from his master there was an expression of anxiety in his eyes. Pridemore patted him on the head. "Don't you worry a bit," he said, caressing the dog, "I'll be right back in the next car." And the dog understood, for he lay down without a whimper. The whereabouts of Mrs. C. M. Smith of Phoenix, Ari., who is supposed to be in Kansas City, is puzzling the local police as well as her husband, who is searching every city along the line of the Santa Fe railway. Circulars with the woman's picture and offering a reward have been sent to all parts of the country. Mrs. Smith was supposed to have passed through Kansas City on October 7, on her way to Phoenix. Her husband describes her as 24 years old, 145 pounds in weight, five feet three inches in height and is accompanied by two little girls, 4 and six y ears of age, respectively. G. W. Wyatt, 426 Oakley avenue, yesterday requested the police to institute a search for his son, Everett, 18 years old, who disappeared from his home Saturday, and has not since been heard from. A small skye terrier, covered with mud, wet and bedraggled, his tongue hanging far out of his mouth and his tail between his legs, slunk into the Union depot late yesterday afternoon. He scampered across the floor to see the woman's waiting room and there close to a radiator found a warm spot where he cuddled up far out of sight. The terrier was the only one of a score of dogs lost, strayed, stolen or deserted that have been making their home at the Union depot who returned after having been captured and surreptitiously placed on outgoing trains by members of the Red Cap brigade. It is likely that the rest will return if they can find their way back. The Union depot is about as close to dog heaven as a stray would find in many days' wanderings. The waiting room and nooks and corners in the baggage and mail rooms are always nice and warm. Then the food is far above the average dog food. Sympathetic little girls with chicken and ham sandwiches think nothing of feeding them to the dogs and going hungry. Once it was reported at the depot, a dog died of the gout, so well had it been fed. It takes but a couple of days for the leanest canine to take on a nice glossy coat. It may be humane to take care of the dogs and permit them to eat the lunch leavings, but the attaches of the depot declare they are a nuisance, so during the summer the dog catcher never leaves the depot empty handed. His visits to the depot are fewer in the fall and winter and the strays who happen along come to regard the depot as their legitimate home. Yesterday was dull day at the depot. Both incoming and outgoing trains were very light and half a dozen of the Red Caps found time hanging heavily on their hands. "Let's give the dogs a ride today. They might enjoy a Sunday railroad excursion," was the suggestion of one. A moment later several Red Caps were hunting up the dogs about the station. They played no favorites. That it was not easy to get the dogs on the trains without the knowledge of the train crew was quickly discovered. Various plans were adopted. Some of the dogs were smuggled on the sleeping cars, others got into the day coaches and the rest were put on blind baggage or in the mail or baggage cars. The little skye terrier, who found his way back will probably be allowed to remain at the depot as a mascot. PLEADS SIZE FOR HALF FARE. Age, and not height, is what counts in getting railroad fares halved, as Everett Crane found to his sorrow yesterday afternoon. Everett is 22 years old, thirty-seven inches high, and weighs sixty-two pounds. When he is not posing as Prince Henry, the smallest man in the world, with a carnival company he makes his home with his father, John S. Crane, a farmer near Lenexa, Kas. Everett is so small that he rides around in a go-cart which would hardly accommodate a good-sized child. He has been out on the farm with his father for some weeks, but yesterday he got a wire from the carnival company to join them at Houston, Tex, and getting in to his go-cart, he was wheeled over to the station, where he arrived about 5 o'clock. An usher hunted up the Missouri Pacific agent for Everett, who has a small body but a well developed head with the unmistakable face of a man. "I want to get a half-rate ticket to Houston," piped Everett in his childish treble when the agent came up. The voice was a puzzler, but the face was not. "How old are you?" asked the agent. "Twenty-two last October," said Everett. "Well, you can't get a half-rate when you are that old," said the agent. "But look how small I am," said Everett. "I don't take up hardly any room." The agent, however, was obdurate and Everett had to pay full fare. OFF FOR TAFT RIVER TRIP. More than a half hundred prominent Kansas City men, comprising the delegation that is to go down the river on the steamboat Gray Eagle in the presidential party, departed last night over the Chicago & Alton railroad on a special train consisting of five sleepers and a baggage car for Alton, Ill., where they will arrive this morning. Decorators who were sent to Alton in advance, reported last evening to Secretary Cledening of the Commercial Club that the boat will be one of the handsomest in appearance in the big fleet. It was a merry party which met at the Union depot last evening and as the train pulled out cheer after cheer was heard for the deep waterways convention which will be held in New Orleans Saturday of this week and Monday and Tuesday of next week. The delegates expect that President Taft will breakfast with them on their boat Tuesday morning either at Cape Girardeau, which will be the first stop after the fleet leaves St. Louis, or between the Cape and Cairo. The Kansas Cityans will arrive in Alton this morning in time to board the Grey Eagle and be landed at the levee in St. Louis at 9 a. m. They will go to the Coliseum, where President Taft will speak at 11 a. m. The trip down the river will begin at 5 p. m.
Imbued with the "Kansas City Spirit" and a determination to impress upon the big waterways convention at New Orleans the need of improving the Missouri river, the Kansas City delegation will leave for Alton, Ill., at 9 o'clock tonight on four special Pullman cars by way of the Chicago & Alton railway. Decorators were sent to Alton Friday night and by the time the Kansas City delegation arrives tomorrow morning the Gray Eagle, the boat on which the Kansas City delegation will ride, will be one of the gayest in the fleet. At least that was the declaration last night of E. M. Clendening, secretary of the Commercial Club, who has made all of the arrangements for the trip. Yesterday it seemed very unlikely that President Taft would be able to accept the invitation of the Kansas City delegation to ride at least part of the way down the river on the Gray Eagle. More than a dozen telegrams were exchanged with the management of President Taft's itinerary, but late last night Secretary Clendening was informed that it would be practically impossible. He still hopes that the president will find time to visit the Kansas City boat and take breakfast on the steamer Tuesday morning. The "Gray Eagle" will reach St. Louis at 9 o'clock Monday morning. President Taft will speak in the Coliseum at 11 o'clock. The party will embark at 4 o'clock in the afternoon for the great trip down the river. The fleet arrives at Cape Girardeau at 6 o'clock Tuesday morning, Cairo, Ill., at noon, and Hickman, Ky., at 4 o'clock. Memphis, Tenn., and Helena, Ark., will be the principal stops on Wednesday. Vicksburg will be the only stop of importance on Thursday with Natchez and Baton Rouge on Friday. The fleet will arrive in New Orleans early Saturday morning and until the following Tuesday night there will be a continuous round of convention work and receptions in the southern city. Grand opera, addresses by the governors of the different states, inspection of the city, and attendance at the convention will take up about all of the time of the Kansas City delegation. The party will leave New Orleans at 6:20 o'clock Tuesday night. Besides Secretary Clendening, members of the delegation of seventy include Jerome Twitchell, J. H. Neff, Hon. Edgar C. Ellis, C. S. Jobes, H. F. Lang, W. B. C. Brown, C. D. Carlisle, W. G. Mellier and Hon. W. P. Borland. The greatest religious convention ever was that which was held in Pittsburgh last week when more than 30,000 members of the Brotherhood of Christ met in one great body, according to R. A. Long, who returned yesterday from Chicago with the special train carrying 210 Kansas City representatives from the convention. Half an hour after the train arrived in Kansas City, Mr. Long was busy in his office attending to work which had piled up during his absence. The Kansas City delegation, with Hiner's band, excited the greatest admiration. A special train with the best Pullmans in the service, all furnished by Mr. Long, was a subject that filled whole columns of the Eastern press. The special train was routed to Buffalo where Niagara Falls was visited, and then over the Lake Shore to Chicago, where the party remained a day. "It was a great gathering," Mr. Long said yesterday. "Thirty thousand delegates in song and prayer has an influence that no one could resist. Yes, I think our delegation was the largest, considered the distance that we had to travel." Topeka is to have next year's convention, though Des Moines and Louisville and Boston made a fight for it. If 30,000 delegates attend the Topeka convention it is rather doubtful whether quarters could be found for such a gathering. The distance, however, makes it improbable that such an event will take place. That America is one of the greatest countries in the world, and that Kansas City is one of the prettiest cities in America is the opinion of Herr Bernard Dernburg, secretary to the German colonies in Emperor William's cabinet, who spent a few hours yesterday visiting friends in Kansas City. Dernburg has just completed a three weeks' tour of inspection of the cotton industry in the southern states and will sail for Europe next week. "America is a great country," he said last night, as he sat in a private car, shortly before it was pulled out on the Burlington Chicago limited. "I have been all over the southern states and have inspected the cotton industry from every standpoint. I have looked over the plantations, talked with the laborers and, through the kindness of the owners, have been taken through many of the important mills. But my business in Kansas City is one of pleasures. I came from Oklahoma City and couldn't resist the temptation of stopping a few hours in your city." As colonial secretary, Herr Dernburg has visited all of the principal German colonies and particularly those in South Africa. To get American ideas and American methods at first hand was his purpose in coming to this country. In every city throughout the South, commercial bodies have extended courtesies to the distinguished visitor. As soon as he landed, the Seaboard railway offered him use of the president's special car in which Dernburg has traveled for the last three weeks. James G. Cantrell, general Western agent of the Seaboard, has accompanied him on his entire Western trip and has arranged the itinerary as far as possible. A complimentary luncheon was given to the distinguished German yesterday noon by A. E. Lombard, president of the Corn Belt bank, who has known the secretary for several years. Mr. Lombard and a party of friends accompanied the secretary to the train last night and bade him farewell. With Herr Dernburg on his present trip is Dr. William Busse, under secretary to the colonies. Dr. Busse does not talk English very fluently and depends on Herr Dernburg for most of his information. Before departing for Germany, Dernburg will remain in Virginia several days and study the tobacco industry in the same thorough manner that the cotton industry has been studied. An incident yesterday morning in the matter of train schedules came near causing the German secretary to remain in the city over night. When Mr. Cantrell told the Burlington official that he expected to attach the private car to the Burlington Chicago Limited, he was informed that private cars were not attached to that train. It was necessary to wire to Chicago for permission to attach the coach. Herr Dernburg refused to discuss German politics. dent at Missouri Pacific Crossing. Despite the warning of the flagman at First and Main streets last night, A. D. Buyas, a farmer living a mile northeast of Harlem, drove across the Missouri Pacific tracks at that point and was struck by an eastbound passenger train which was coming at a high rate of speed. Buyas, who was accompanied by Hobert, his 11-year-old son, was struck on his head on one of the rails when he was thrown from the wagon and received fatal injuries. The boy, aside from slight bruises, was not seriously injured. Buyas came to the city yesterday morning with Mrs. Buyas, Hobert and Pearl, the 14-year-old daughter. Before starting to the ferry at the foot of Main street to get across the river, Mrs. Buyas and Pearl decided to walk. "Somehow, I feel that something is going to happen," she told her husband. "I'm going to get out. I feel lots safer, anyway." As the man started down the steep incline toward the river the team seemed unable to hold back the weight. It was almost dark and the flagman with his red lantern could be seen at the crossing. Suddenly he began to wave the red light frantically, but it was too late. Though Buyas in desperation tugged at the lines he was on the track, with the train only a few feet away. The horses passed to safety but the engine struck the rear part of the wagon. Both occupants were thrown high in the air and the wagon completely shattered. The boy arose, but the father lay moaning, and was found to be unconscious. the train did not slacken its speed. The ambulance was called from police headquarters, with Dr. F. C. LaMar hurried to the scene of the accident. The injured man and the frightened family were placed in the ambulance and taken to the Emergency hospital. It was found that Buyas had received a fractured skull, a broken left arm and right leg. The physicians had little hope that the injured man would live until morning. vantage of Last Day Rates. Yesterday, the last day of the colonist rates to the Pacific coast, brought out a record breaking crowd of homeseekers. Every train west bound yesterday carried additional coaches and yesterday morning Santa Fe No. 1 for California was made up of three sections. The colonists this year practically have all gone to Southern California. Very few have gone to the Northwest or the central sections in the West. Crowd Sees Foaming Ale Wasted. A beer wagon, driven by Samuel Kroyousky of 1527 West Ninth street was struck by a Wabash train last night at Union avenue and Hickory street and was practically demolished. The barrels of liquor were broken open and a stream of beer poured into one of the catch basins. A big crowd gathered and watched the foaming beer escape. The driver and team escaped injury. MONTGOMERY, MO., Oct. 7. -- Dr. Frederick A. Cook, now on the Wabash train on his way to Kansas City, sends this message: "Say to the people of Kansas City that I appreciate their attitude and fair treatment of the polar problem." Kansas City will be told all about the North Pole tonight in Convention hall by Dr. Frederick A. Cook, the first man to reach the top of the earth. Dr. Cook will arrive at 7:30 o'clock this morning in a private car over the Wabash. He comes from St. Louis, where he lectured last night. The Kansas City welcome will consist of automobile rides and banquets. He will be met at the Baltimore hotel this morning by city officials and their wives. They will all shake hands and get acquainted. Dr. Cook is accompanied by his wife and two daughters. The women in the party have been detailed to show them a good time. The officials will devote their time to the hero. The Cooks will be taken for an automobile ride. The course will follow the boulevard system through the city, and the visitors will be shown the city parks. The ride will end at the Country Club. Here the women in the party will be left behind. Mrs. Cook and her daughters will be entertained by committees of Kansas City women. The directors and their guests will be driven to the Evanston Club. Here the men will get better acquainted with their noted guest. While in St. Louis more than 10,000 persons packed the Coliseum as Dr. Cook narrated the horrors and tortures of his dash to the North Pole to his breathless audience. STEPS IN FRONT OF TRAIN. While walking along the Union Pacific double track about nine miles west of Kansas City, Kas., between Edwardsville and Bonner Springs, Roy McGee of the latter place stepped from one track to get out of the way of a passing construction train and was killed by a passenger train coming from the opposite direction. He was 22 years old. Dr. J. A. Davis, the coroner, was notified and he instructed Dr. Heath of Edwardsville to assume charge of the body, which was taken to Bonner Springs. BUY LAND FOR NEW STATION. As forcasted in The Journal a week ago, $125,000 was paid yesterday by the Grand Avenue Building Company to William Huttig, president of the Western Sash and Door Company, for the property and building of the company at Twenty-third and Grand avenue. There are 45,000 square feet in the tract, wh ich faces 168 feet on Grand avenue and runs through to Walnut street. About 5,500 square feet will be taken by the Kansas City Terminal Railway Company in the building of the Union passenger station, and it is understood that eventually a hotel will be built on the remaining part of the property. The offices of the sash and door company will be occupied and used at once by the engineering forces of the terminal company, and the balance of the building will be used by the Huttig company for one year. "A year from today the Western Sash and Door Company will have a big new plant built somewhere along the line of the Belt railway," said Mr. Huttig yesterday. "We have three different sites under construction." Garnett Instead of Kansas City. Through a mistake, for which she cannot account, Miss Emma Howe, 17 years old, bought a ticket and checked her trunk for Garnett, Kas., instead of to Kansas City, where her sister, Mrs. Hattie Fields, resides, before leaving Ola, Ok., Monday afternoon. The trunk was put off at Garnett and Miss Howe would also have been detained there for lack of funds to proceed further, but several traveling men made up a purse to pay her fare here. When she arrived at Union depot over the Santa Fe last night it was to discover that her troubles had only just begun, for the paper on which her father had written her sister's address in Kansas City was in her trunk. The girl was cared for overnight by Mrs. Ollie Everingham, the depot matron. The name of Mrs. Hattie Fields does not appear in the city directory. Kansas City declared in favor of progress at the special election yesterday to decide whether or not the voters favored a new $30,000,000 Union station near Twenty-third street and the Belt Line, and freight and passenger terminals which form a part of the plan. The vote in favor of progress was almost unanimous. The total vote in the fourteen wards of the city and in the newly added precincts caused by the recent extension of the city limits shows in a general way a uniform expression of opinion by the voters. The main proposition voted upon was that granting the Kansas City Terminal Company, which is to build the new Union station and terminals, a franchise for 200 years. It was necessary to put this before the voters owing to the state constitution limiting franchises to thirty years. The vote on this was 25,668 in favor of the proposition and 700 against it. Two other propositions were offered the voters. The most important of these to the people of the entire city was that amending the charter so that the park board would be empowered to sell to the Terminal company certain lands needed for the widening and improvements on the present tracks on the Belt Line. The vote on this proposition was 24,644 for and 639 against. The third proposition concerned the proposed change of grand of three streets crossing the present Belt line. It will be necessary, in building the passenger and freight tracks of the terminal company, to depress the grades of three crossings, so as to allow vehicle and foot traffic under the railroad tracks. As property owners concerned presented a majority remonstrance, the new city charter provided that the voters should pass upon the proposed plan. ST. MARY'S BOYS MEET HERE. Two hundred and fifty boys, all sizes and ages, gathered at the Union depot yesterday morning, and departed on a special train over the Union Pacific railroad for St. Mary's, Kas., where they will attend school. The boys are returning to school from their summer vacation, and the Reverend Father Dieters, the principal of the school, arranged that practically all should meet in Kansas City. There were five coaches on the train. DRANK LIQUOR ON A TRAIN. ceeds Against Grain Valley Men. Norman Woodson, assistant prosecuting attorney, yesterday issued information against two men of Grain Valley, charging them with violation of the new law which forbids the drinking of liquor on trains and the riding of intoxicating persons. Mr. Woodson was not at liberty to give the names yesterday. "The men," said he, "got on a train at Independence and rode to Grain Valley. Our information is that they were intoxicated and that they made trouble on the train. The new law makes this a misdemeanor. With his mind probably deranged by ill health and financial worries, Charles W. Marsh, formerly a labor leader in Kansas City, Kas., committed suicide by jumping in front of a freight train in that city yesterday morning about 10 o'clock. He died in a police ambulance on the way to Bethany hospital. Marsh was 54 years old and lived near Eighth street and Walker avenue in Kansas City, Kas. He was a painter and paperhanger by trade. Mrs. Marsh witnessed her husband's suicide from their home, which is only a short distance from the tracks of the Kansas City-Northwestern railroad. He had been despondent for some time and had made threats. While his wife was attempting to dissuade him, he broke away from her and ran to the railroad tracks on which a freight train was approaching and threw himself in front of the engine. His body was almost completely cut in two by the wheels of the cars. Funeral services will be held this afternoon at 3 o'clock at Butler's undertaking rooms. Burial will be in Oak Grove cemetery. He is survived by a widow and a son, Dr. J. L. Marsh.